Artist Derek Harrison began his journey at a front desk job in Denver, Colorado, filling up sketchbooks to pass the time. He eventually put together a portfolio and showed it to tattoo artist and shop owner Brad Cramer, who offered Derek a tattoo apprenticeship. “I basically dropped my entire life and decided to work as hard as possible and see where it would take me,” he says. The apprenticeship offered him a chance to learn fundamental drawing techniques and he was introduced to rendering, color theory, proportions and rhythm. And although they agreed on a year-long apprenticeship, Derek began tattooing after only four months. In 2008, three-and-a-half years later, Derek moved back to Southern California where he started work at Energy Tattoo in Santa Barbara. The progression of his work was influenced by Energy owner PJ Ferrante, and Derek spent three more years in the tattoo industry before dedicating himself to painting full time. Since then, the 28-year-old artist has won several awards and has been featured in art compilation books and trade magazines. 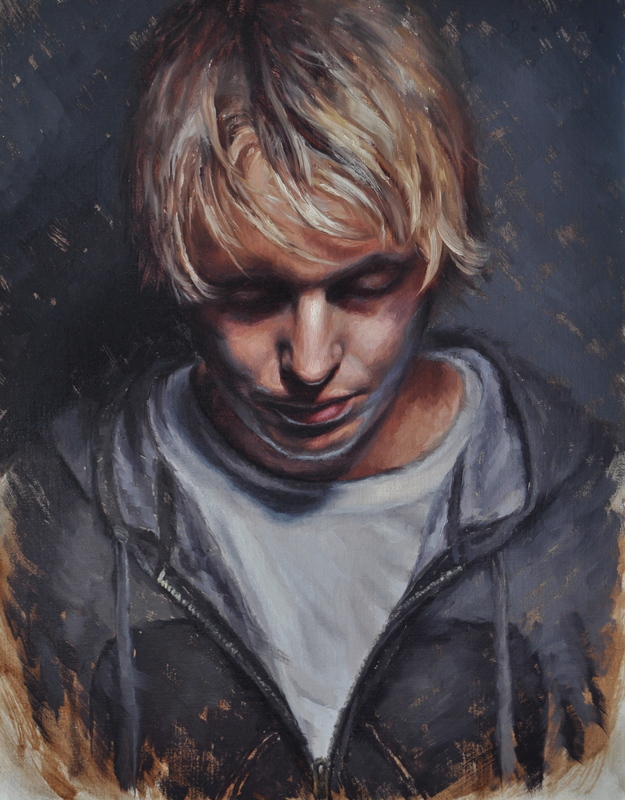 Derek’s paintings range from portraits to landscapes, representing the people and the world around him. He excels in modern realism, capturing his subjects seemingly without effort. But even as a naturally talented artist, much of his ability comes from extensive training with some of the most accomplished painters of our time. Derek has studied under the skillful artists Shawn Barber, Jeff Gogue, Jeremy Lipking and Sean Cheetham. “They produce the type of work that I have always wanted to,” Derek says. Learning from such masters was the closest to an academic learning experience he had undergone, and it opened him up to seek more. “I want to take my work as far as I can. That means I need all of the skills possible,” he says. “I had a decent amount of experience drawing, but hadn’t spent enough time on the foundational tools to really be able to execute the type of works I wanted to do.” So for the past year, Derek has been studying at the Los Angeles Academy of Figurative Art. Now that he’s gone back to learn the fundamentals of his profession, he feels much stronger and more well-rounded as an artist. And while he’s already making a living as an artist, Derek believes that the learning never stops — he plans on continuing formal training and taking workshops for quite some time to come. Alisa Damaso: Let’s talk about your beginnings. What initially compelled you to make art? Derek Harrison: I grew up viewing art almost like magic. I was — and still am — amazed that someone could create something so moving, so real, so beautiful, with paint or whatever medium they used. I took some very basic art classes all throughout school and realized I had a proclivity for it. So once I started to create art that people responded to, I thoroughly enjoyed everything about it. As I got older and eventually started to receive some training, it was like learning that magic trick and I was hooked. AD: Who is your biggest influence? DH: Like in most professions you learn about and meet people who are considered to be at the top of their industry. Shawn Barber was one of these people. He began as an illustrator, eventually becoming a successful fine artist, and then a phenomenal tattoo artist. I had a deep admiration for his work and since he had moved into a new studio in Los Angeles I was close enough to take workshops with him every month for almost two years. That experience truly opened up my world and undoubtedly changed my life forever. My realization that art, painting, etc. is based on hard work, knowledge and determination — [it’s] not some talent you’re born with and not something to be arrogant about. It’s a vocation that is very rewarding if you put everything you have into it and remain humble. I began painting every day, eventually showing in galleries selling work, and it basically started to become a second career. Then it became extremely difficult to balance painting and tattooing. After a very difficult decision I decided to dedicate myself to painting full time. Fine art is my true passion and as much as I love tattooing, I had to chose one. AD: Have you tried other media before landing on oil paint? What was your experience with those? 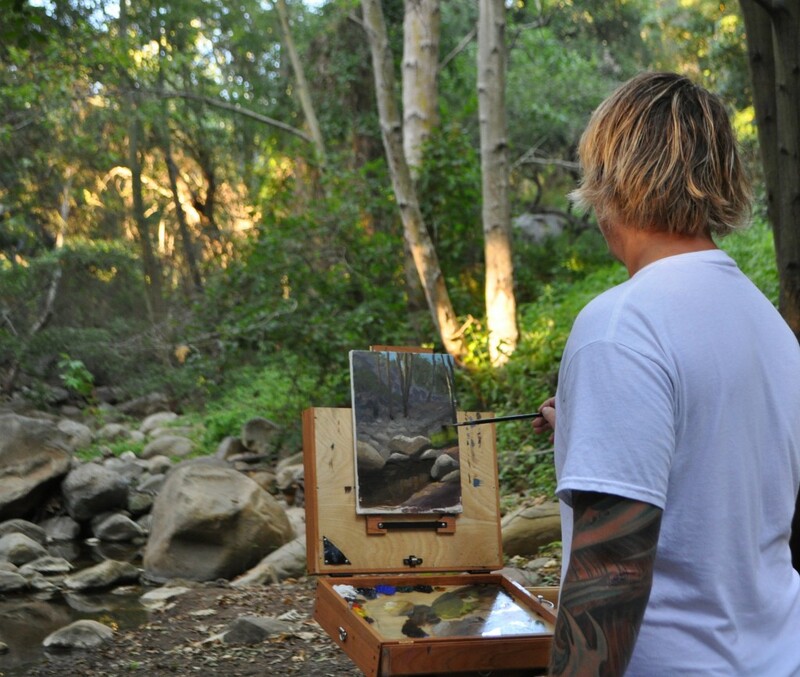 What do you enjoy most about oil painting? DH: I have indeed experimented with most media and still do works with acrylics, watercolor, gouache, tattooing, charcoal and most recently sculpture. They’re all great! But to me nothing compares to working with oil paints and the organic quality an oil painting has — the realism and looseness you can achieve with it, the versatility and fun — it’s a beautiful medium to work with. DH: Progression, progression, progression… The endless pursuit of trying to do the best work I can. I keep an open mind to whatever may come but hope that I can create paintings that move others the way works of art have and continue to move me. Art has an amazing capacity to connect with everyone. I feel so grateful to be a part of it, work with so many great people, do what I love and paint the world and those who inhabit it. I hope to teach in the future. I’ve held some workshops at my studio where we all split a model fee and paint the portrait from life, usually in 4-hour sessions. It’d be great to give back as much as I possibly can and hopefully help anyone who has the desire to be a part of art, because it’s amazing!